It has been quite some time since we have been able to offer a great little color shift sapphire so this gem was a welcome find. 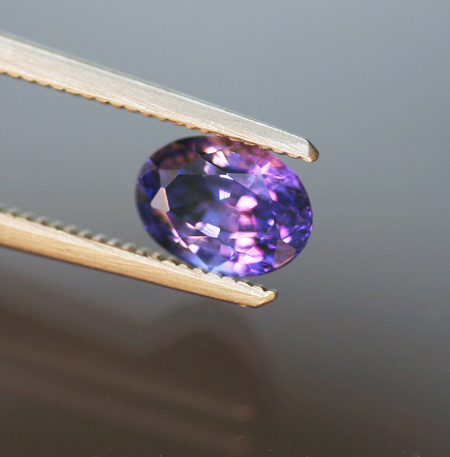 The cool daylight color of the stone is very violet-blue and quite saturated, while the warm-light color is completely purple. Indeed, we should really say color change here, but as the hues are visually close and perceptions vary, we prefer to use ‘shift’. A darker tone, but perfect for a stone of this size - in concert with excellent brilliance, this gives a very rich look. Perfectly clean and with a nice, classic Sri Lankan oval mixed cut this is a fine example of an increasingly rare type.